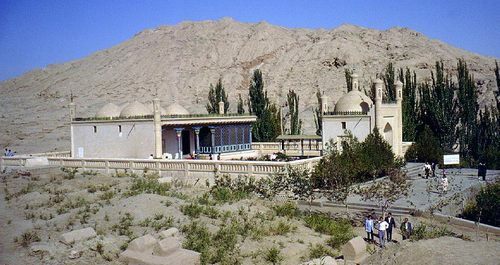 Tomb of Mahmud Kashgari is situated on the Mount Upal around 48 kilometers west of Kashgar. Mahmud Kashgari was a well-known Uighur scholar and linguist in the Karahan Kingdom in the 11th century. Born in Upal, Kashgar in 1008, he was born into the royal family and was a descendant of the Brah Khan. In 1076, he finally completed his world-famous masterpiece "The Turkic Dictionary" in Baghdad. In 1080, he returned to his hometown to build up a scripture school and studied further. In 1105, the great scholar passed away in his hometown. Surrounded by greens, Tomb of Mahmud Kashgari was originally built in the early 12th Century. It consisted of a gate tower, a tomb chamber, and a number of houses for worshiping, chanting, and boarding. It was an early Islamic building in Xinjiang. Unfortunately, the original tomb was damaged in an earthquake in 1985. In the following year, it was rebuilt by the government. The original layout was left. In addition, an exhibition hall was added to the complex. A cylindrical Bunker House is built on both sides of the gate tower, which is an Islamic building. The tomb chamber is more than 50 meters from the gate tower. With a dome, the chamber is in civil structure. The ceiling of the dome is decorated with painted wood carvings. A small mosque is situated to the east of the tomb chamber. You will find some ruins on the left of the tomb chamber. It is said that it is the ruins of the scripture school set up by Mahmud Kashgari. You can visit the exhibition hall north of the tomb chamber. At the hall, you can explore the works by Mahmud Kashgari if interested. If you are interested to study the works by Mahmud Kashgari displayed at the exhibition hall, the best time to visit is in the morning during the opening hours. The best months to visit are from April to September. There is no direct bus from Kashgar to Tomb of Mahmud Kashgari. The only option is to rent a vehicle. Interested in visiting the Tomb of Mahmud Kashgari on a Tour? Wendy Wei Tours offers a variety of different packaged tours as well as custom tours including the Tomb of Mahmud Kashgari, among other attractions and destinations. To find out more, please visit our Tours page or Contact Us directly to find out more.